Over the next month, we are proud to be hosting two prestigious competitions on campus. At the beginning of April, the London regional finals of the Institution of Mechanical Engineers' (IMechE) Design Challenge will take place at MDX. Six universities from the London area are taking part. The competition for Year 1 undergraduates is on Tuesday 2 April and the competition for Year 2 undergraduates is on Wednesday 3 April. 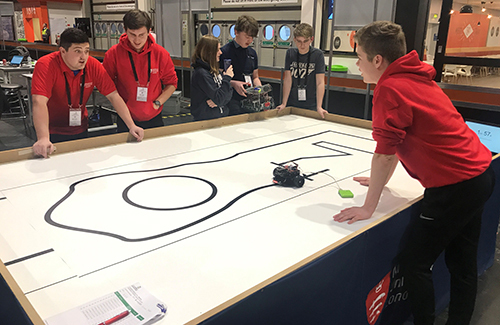 The aim of the Design Challenge is to connect engineering students to their discipline in a practical way, by requiring them to design, build, run and present a device meeting strict technical specifications and within budget. Competing teams are judged not only on the effectiveness of their device, but on their communication skills: they will have to produce a technical poster for the design, and give a verbal presentation to the judging panel. The winning team goes through to a national final at the Institution's headquarters in Birdcage Walk later in the year. A team of first year MDX Mechatronics students won the national Design Challenge in 2016, when the task was to create a miniature version of a Line Launcher, a device which fires a rope from one ship to another at sea. At MDX, all design engineering students are encouraged to enter the competition. Between 8-12 April, we will also be hosting four Team UK selection events for the biennial vocational skills world championships WorldSkills 2019 competition, to be held in Kazan, Russia from August 22-27. The event in Kazan will be opened by Russian President Vladimir Putin at a ceremony in Kazan Arena in front of a crowd of 45,000. The main competition venue is the Kazan Expo International Exhibition Centre which opened last year. We have a longstanding involvement as a competition organiser and exhibitor at WorldSkills UK, held annually at the National Exhibition Centre in November. Trials for the Floristry, Cybersecurity and Cloud Computing competitions will be held in the Quad and the Ritterman Building. There will also be a Chemistry Laboratory Technician competition held in the Hatchcroft building. Three of our students will compete for a place in the national team in the Lab Technician event. Members of the public will be welcomed to watch the trials at MDX, which will also feature selected international competitors.